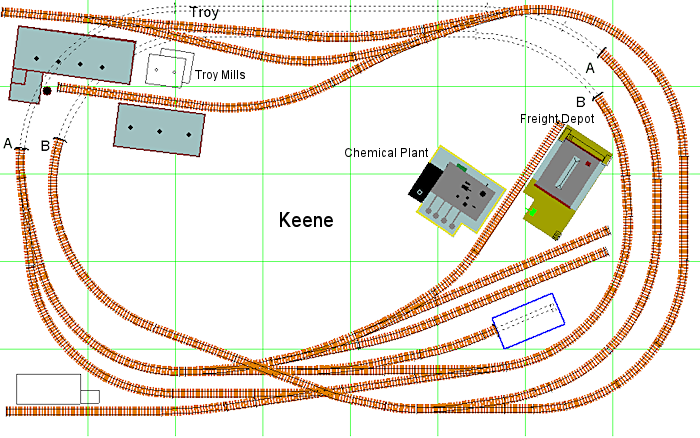 My layout, Cheshire Rail, is a fictional pike based on the real-life Cheshire Railroad, which once served parts of Massachusetts, New Hampshire, and Vermont. The original Cheshire Railroad was chartered in 1844. It merged into the Fitchburg Railroad in 1890, becoming the Cheshire Branch. In the real world, the New Hampshire and Vermont portions of the line were abandoned in 1970, while the Massachusetts section persisted until 1984. In my scenario, the C.R. remains a part of the B&M/Guilford system – and interchanges with it – so one might expect to see rolling stock and motive power on the C.R. from the B&M. The biggest local customer for the C.R. is Troy Mills, a sprawling textile mill in the small town of Troy, New Hampshire. Troy Blanket Mills began in the 1850s as a maker of fitted horse blankets but in more modern times made synthetic textile products for the automotive industry. The real Troy Mills remained in operation well into the 21st century. I drove past it on my way to work every day for more than 15 years. It consisted of a hodgepodge of buildings of many styles cascading down a hillside and constructed over a period of 150 years. For the purposes of my layout, circa 1975, Troy Mills still receives raw materials and ships finished products by rail. The raw materials include dyes and other chemicals produced in the nearby town of Keene. Other materials arrive by rail from “off the layout.” Troy Mills is a large enough complex to have its own small industrial switcher. The C.R. has a small yard and engine facility in Keene. The yard is conveniently close to the chemical plant, which shares a spur with a small freight depot. Freight arriving at the depot is distributed to the town of Keene by delivery trucks and sent on to Troy Mills by rail. There is an as yet undefined industry in the front left corner. In the real world, many Cheshire Railroad buildings in Keene are still in use today as commercial retail and office space. The turntable pit in Keene has become a public green space. I am very interested in scenery, and by setting the layout in the autumn, the possibilities are exciting. If you have ever seen New Hampshire in the fall, you know what I mean.